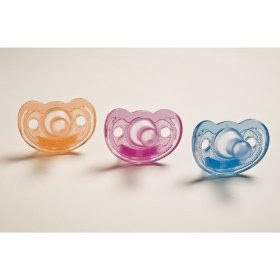 I was a huge fan of the soothie pacifier with both girls, aside from when it fell out of their mouth and rolled forever. I've recently heard that these gumdrop pacifiers are even better. I am a fan of the orange and will definitely be giving them a try. We like the gumdrop pacifiers at our house. The thing i like about them better than soothie's is that they have a 'cut out' for the nose, much shaped like a typical pacifier. You can also get them in a vanilla scent, which they claim helps calm and soothe your baby but i found that once i washed them the smell gradually went away. Not a big deal though. My friend just gave me one of these and my new baby loves it!! Give these a try! I was a Soothie fan before too. My son LOVED his gumdrop- until he ditched the binky permanantly at three months, but would only take that one. We had the blue, but i did hear that you could buy them with a vanilla scent! They are my favorite! Or rather, my baby's! If you order now...they even have purple...oh, we tried the vanilla scent - she wasn't a fan. sour cream lemon cake... the best ever. see kai run spring line.